Monmouth Vinyl began operations in January of 1990, out of the family aluminum siding business which dated back to 1974, founded by Mr. Steven LaPietra. The backbone of the company has always been siding, but we have also been installing roofing, windows and doors for over 40 years. As the exterior remodeling industry evolved, so did we. Other services were added, always with top of the line products as our feature. We now offer professional installation of Azek & TimberTech decks, a variety of stone veneers, and our exclusive RainPro gutter and leader system. We continue to grow as the industry does, and our latest service addition is Metal Roofing products from Englert and Atas. Joe LaPietra, Steve’s son, has been involved in the business since his early teens. He worked for the company throughout and after high school, up until he enlisted in the US Army as an infantryman. After his service he returned home and picked up where he left off. 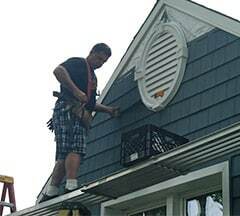 He has years of experience at the installation end, and studied Business Management at Brookdale while he was doing so. He now runs the jobsite operations, as well as performing other management duties. He was born and raised in Howell and currently resides in Manasquan. 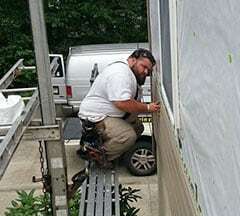 Joe’s younger brother, Jack, is also involved in the business and is currently in the field as an installer.